Find a Sightseeing trip that explores Cambodia And Vietnam. There are 25 tours to choose from, that range in length from 3 days up to 27 days. The most popular month for these tours is September, which has the most tour departures. 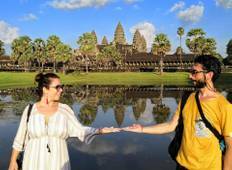 "We had 10 amazing day in Vietnam via Go Asia Travel Landing in HCM city and was taken..."